One of the aspects that always intrigued me most in the martial arts is the mental and psychological side. I read as much as I could on this subject but often find the information too woo-woo or pretty much useless because it lacks practical guidelines. Some 20 years ago, I discovered Progressive Muscle Relaxation and have used it ever since for both my own training and for helping clients. It’s one of the fastest and most efficient techniques I know to teach people how to relax. But relaxation in and of itself isn’t enough to become a better martial artist or a more skilled fighter. You have to know how to apply it to your training. Through the years, I developed my own way of training and teaching this and wrote about it a bit in Loren’s book Solo Training 2. 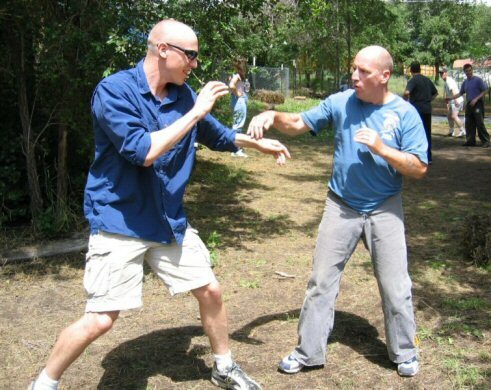 But when a friend of mine, Professor Drew Anderson, brought out an e-mail course on this subject specifically for martial artists, I was obviously very excited to learn more about it. My name is Drew Anderson. I’m a psychology professor and licensed clinical psychologist. I’ve been athletic all my life, but I didn’t start martial arts until my 20s. I dabbled for a bit before getting deeply involved in judo. I trained in judo up to the rank of ikkyu but had a career-ending back injury that forced me to quit. I have since been training in a form of silat. What led you to develop this course? When I was doing judo I found that my own body tension was really interfering with my performance, both in randori and in competition, and I began to adapt some of the relaxation training I used in my psychology work to my martial arts. I’ve continued to use it in my silat training and find it helps a great deal. This course is based on progressive relaxation training (PRT), probably the most well-studied form of relaxation that has been developed. It has been shown to increase relaxation and muscular awareness in literally dozens of research studies. What is PRT and how does it work? PRT works by helping you become more aware of levels of tension and relaxation in your body, and teaches you to adjust your levels for optimal performance. For most people, this involves learning to relax excess muscle tension. How do martial artists benefit from it? First, optimizing muscle tension can make your movements faster, smoother, and more efficient. Second, it can help you deal with stressful situations, ranging from pre-competition jitters to a confrontation at a bar. Does PRT work for all martial arts or only specific ones? It can work for any martial art. The “harder” style martial arts tend to not emphasize relaxation, so individuals studying those styles can typically benefit a great deal from PRT. And although the “softer” arts tend to have more relaxation-type skills built into them, there are still some subtleties that can they can pick up from PRT. What kind of results can people expect from the course? They can expect to become much more aware of their own muscular tension and relaxation and how it affects their movement. They will also develop ways of regulating their muscular tension to optimal levels. Finally, they will learn exercises specifically developed to help adapt these skills for martial arts performance. How long does it take to get those results? Most people are able to notice levels of muscular tension and relax almost immediately after beginning to practice, but generally it takes a week or two of practice to be able to begin to apply these skills in their day-to-day life. The course follows this notion; you first learn the basic skills and then later work on applications of those skills. The course takes 6 weeks to complete. Three weeks are foundation weeks- learning the basics, and 3 weeks are applied. The regular price is 200US$. However, as a member of my site you get a 25% discount when you sign up for Drew’s email course on Progressive Relaxation Training for Martial Arts. To get this discount, you need the promo code you’ll find after you log into your free membership account. Send Drew an email with the promo code, he’ll send you the details to pay via Paypal or credit card and you’re good to go. Drew offers a 100% refund if you’re not satisfied by the course so don’t hesitate to sign up! So if you haven’t already made your free membership account, do so now and you can take advantage of this promotion. You’ll not only find the promo code but also a bunch of free videos and an E-book. Enjoy!